This is soooooo good. I’m finding it hard to come up with words to describe how good this is. Crispy, salty skin, succulent, tender meat coupled with melt in your mouth tart apples, crunchy fennel and luscious butternut squash. I went to sleep thinking about how good this was. WOW and WOW again. This meal was superb. I need to thank Alice Lau, Girl in a Food Frenzy for this recipe. If you haven’t checked out her blog, you owe it to yourself to do so. I like Alice’s blog and read it regularly. She is in culinary school “down under” and does some marvelous dishes. 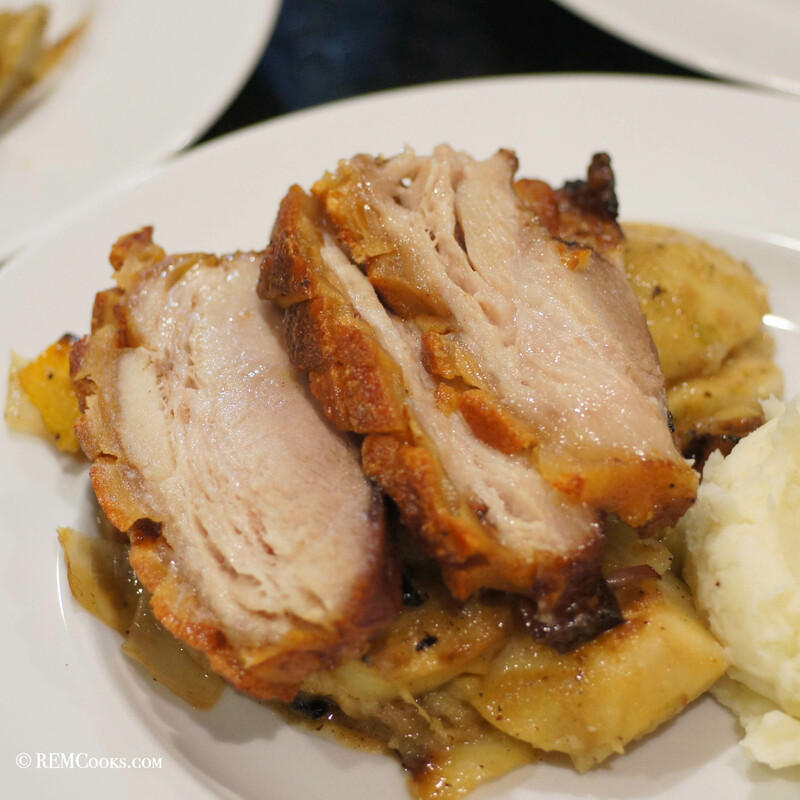 This past week she did a post “Snap, Crackle & Pop part II” in which she strutted her stuff on a a beautifully slow braised pork belly with crispy cracklings, apples and fennel. I looked at her photos and began to drool (I wish my photos were as good). Her technique was impeccable and the results were incredible, not to mention the flavor combination. Now, I love apples and fennel. They go together incredibly well. I also love pork and crispy skin. In fact, when we go to El Paso to visit Baby Lady’s family, we go to a supermarket called Ranch Mart because they deep fry pork skins, chicharones, (large pieces like 24 inches by 12 inches) right in front of you. Some of the pieces have chunks of meat attached; whereas, others are simply skin. It’s just wonderful! So when I saw Alice’s dish it had my name all over it and I had to make it so I did with just a little tweaking. Here is what we did. 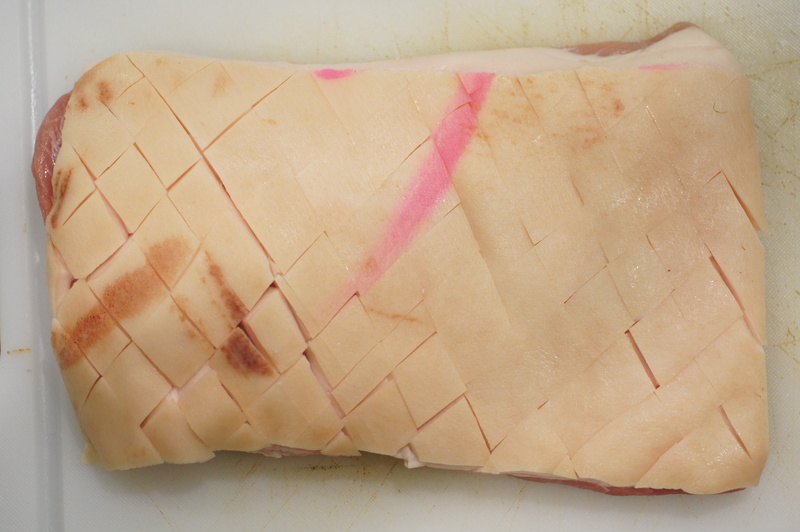 Dry the pork belly and cut diagonal squares into the skin deep enough to go to the fat but not so deep as to cut the meat. Take 2 Tbsp sea salt and rub all over the skin being sure to get it in between the grooves. Turn over and season the bottom with the remaining 1/2 tsp salt and fresh ground pepper. Let sit for 30 – 45 minutes to let the salt work its magic. After 30 – 45 minutes, in a large heavy bottom pan, pour in 2 Tbsp olive oil and over medium-high heat, heat the oil until you can place a wooden spoon into the oil and while pressing down it begins to bubble. Once this occurs, add the pork belly skin side down. Frying the pork belly skin side down accomplishes a couple of things. First, it renders some of the fat from the pork belly. Second, it helps crisp up the skin. 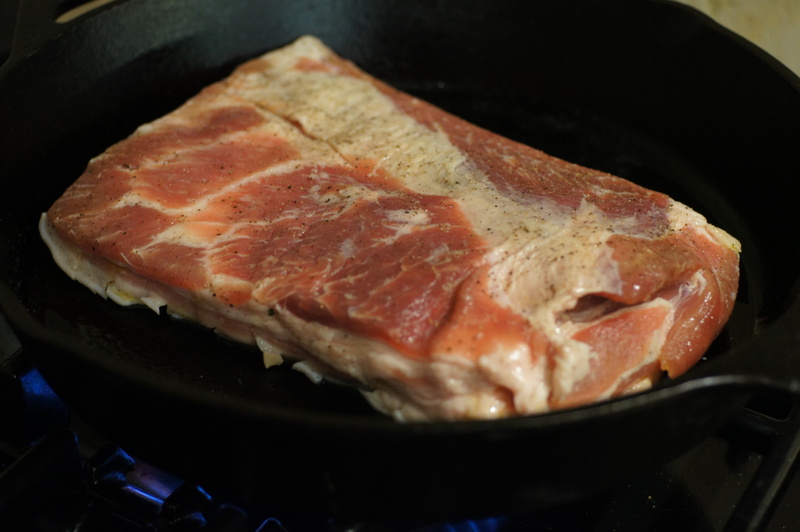 Fry the pork belly for 15 minutes until it turns a golden brown. Just make sure you don’t get caught up in another pressing matter (like I did) because it scorched a small section. 😮 I hate it when that happens! It didn’t affect the taste but it definitely affected its appearance. While the pork is frying, add the apples, onions and fennel to a roasting pan. Squeeze the lemon over them and stir to incorporate all of the flavors. 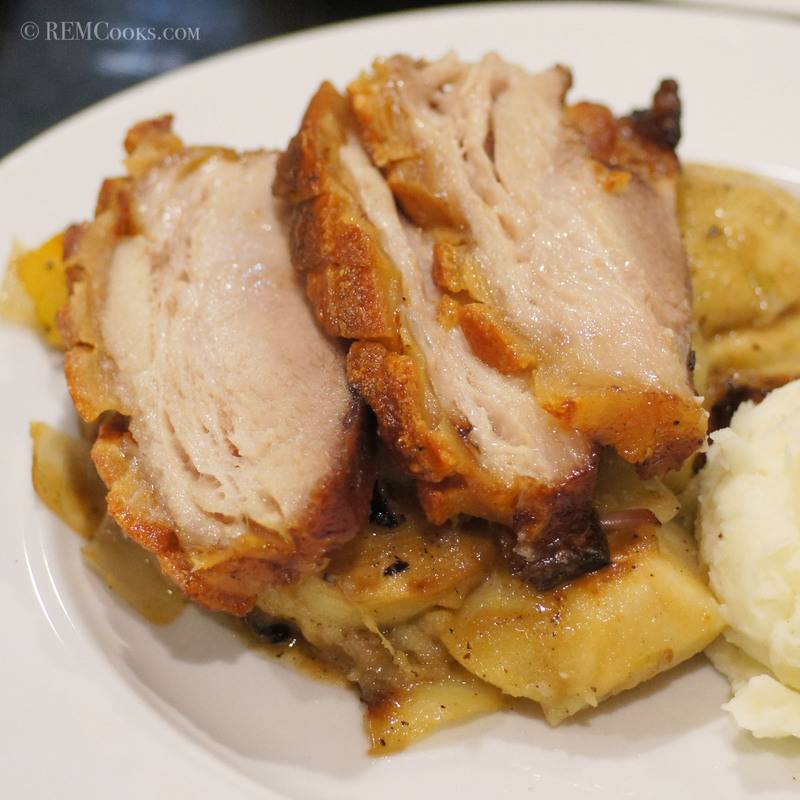 When the pork is finished frying, place it in the roasting pan on top of the apples and fennel. Place the roast in a 325 F preheated oven and ignore for 45 minutes. 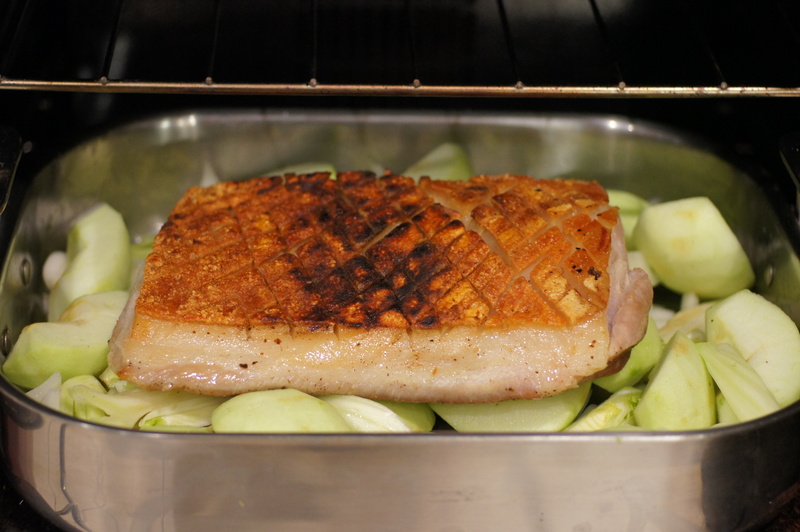 Depending upon your oven and the shape of the pork belly you may need to rotate the pork belly to ensure even cooking. A convection oven really helps with this dish. 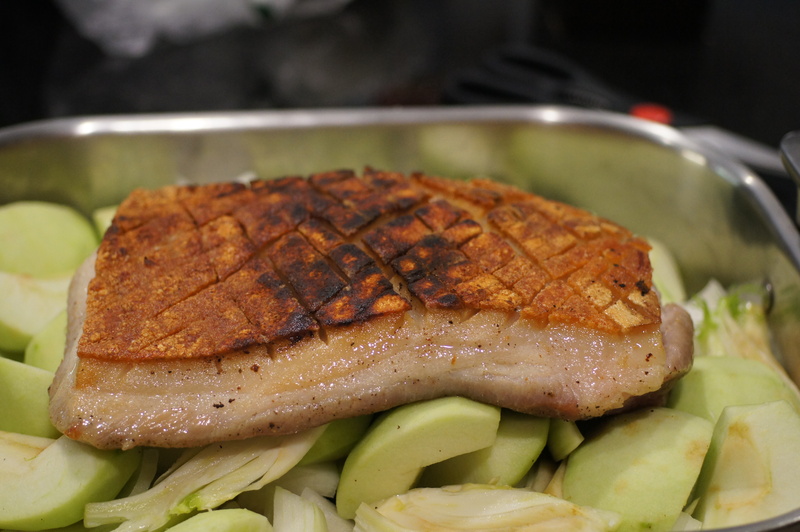 After 45 minutes, rotate the pork belly and gently toss the vegetables. You should notice some of the rendered fat and juices in the bottom. Use these juices to baste the vegetables, NOT the pork belly. Return to the 325 F oven for another 35 minutes peeking every now and then to baste the veggies and rotate the pork belly as needed. After another 45 minutes, remove the pork belly from the oven. By now you should notice the apples are beginning to break down. Pour the apples and fennel into a 4 qt dutch oven with the braising liquid, cover and set aside in a warm place for 30 – 60 minutes. Add the diced butternut squash to the roasting pan and place the pork belly on top of it. Return the pork belly to the oven and turn the oven up to its highest setting, 450 – 475 F. As Alice points out, you need this high heat to squeeze out any remaining water in the skin so it forms perfect cracklins. It will also roast the butternut squash without overcooking it and produce a beautifully sweet, earthy treat that will go with the apples and fennel like you won’t believe. At the end of another 30-60 minutes (you need to check the pork belly after 30 minutes to see if it’s crisping up like you want), turn off the oven. Place the dutch oven with the apples and fennel in the oven along with the roasting pan. This will keep the apples and fennel hot while allowing time for the pork belly to rest. At the end of 30 minutes, remove the pork belly from the oven. It will have a beautiful, deep golden brown color and the diagonal squares will have puffed up. Add the apples and fennel back to the pan and toss with the roasted butternut squash. Turn the pork belly over, skin side down, and carve. 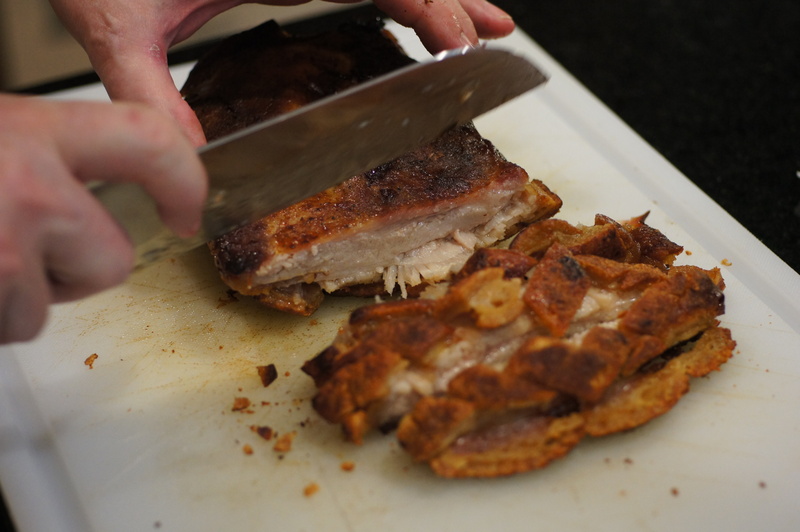 If you try to carve the pork belly through the cracklins, you will find it pulls off the meat. Place a spoonful of the apples, fennel and butternut squash on a plate. Top with slices of pork belly. Serve and enjoy! Wow! I think I should make this tomorrow. Thanks! Guaranteed, if you do you WILL like it. The only problem with this dish and I mean only problem is the pork belly has to be eaten the day it is cooked. It will lose the crispy cracklings in the refrigerator. Now, with that said, a 2.5 lb pork belly fed 3 of us. We were full but once you render the fat and pull the moisture out of the skin you will lose 50% of the net weight. The apples, fennel and butternut squash go unbelievably well together. I am posting the bourbon sauce I made for this as a separate post. All of the flavors were incredible. Looks too good to be eaten! Hi Richard, wow, wow,wow! Now it’s my turn to get hungry when looking at your post! Firstly, thank you so much for not only taking the time to read (giaff.) secondly a big thank you for trialling the recipe (because the way I see it,) a little knowledge goes a looooong way and there’s no point in keeping it to one’s self! Thirdly, I certainly hope your readers enjoy this post because your directions, reasonings, recipe combination etc are all fantastic. Alice, the thanks goes to you. I had 2 pork bellies in the freezer that I was going to cure and make bacon. Once I saw your post I knew the bacon had to wait! This was wonderful. This looks absolutely delicious! Thank you for the post! And now, I’m also following Alice, girl in a food frenzy! It was wonderful and Alice Lau really does some nice stuff. You will enjoy her blog. I also just pinned this. . I’m totally adding this to my “must cook” list! Thanks for your very nice compliment. I’m glad it brought back some memories. Thanks, Richard. I’ve been looking for a good pork belly recipe and this is it. I tried it once a few months ago and was less than thrilled with the outcome. Not anymore. As luck would have it, I just took advantage of a good sale on pork loin and have a freezer full right now. Once I make a dent in it, I’ll be returning here for your recipe. It sounds great and looks incredible served atop the roasted apple & fennel. Thanks, Richard, for sharing another great recipe. Thanks, John. This is a wonderful recipe. You had me at “crispy pork belly”! Do you have to refrigerate the pork while the salt is doing its magic? It’s been about 65-68 degrees in our house recently, is that cool enough? No. I just leave it out at room temperature. Unlike fish and poultry, pork and beef can be left out to come to room temperature without any health issues. It is actually preferable to leave beef and pork out for roughly 30 minutes prior to cooking so it will come to room temperature. This enables you to get a more even cooking of the meat. Hi, I was just wondering where the 2 white onions come in- I’ve read your recipe over a couple of times and it never says when to add the onions. Do you add them to the apples and fennel? Thanks! I’m so sorry. I erred in writing the recipe down. 😮 Thanks for pointing it out to me. I will correct it. Yes, the onions go in at the same time as the apples and fennel.